Recently, we’ve adopted a new ritual with two of our favorite foodies. Every Wednesday, we meet up for dinner, either out or homemade, and watch Top Chef together. It’s something that has quickly become my favorite part of the week. At our last gathering, Frank and Denise offered up an incredibly delicious made-from-scratch albondigas soup and I brought dessert, a mouth-watering salted caramel budino (Italian for pudding). To call this dessert pudding just sounds wrong. The term “pudding” conjures up images of a late 80’s Bill Cosby and colorful cardboard boxes bearing sugary powdered substances. With its smooth, velvety texture, elevated caramel flavor and subtle salty notes that surprise your taste buds, this confection has truly earned the exotic title of Budino and is a current front-runner on my list of favorite desserts. Recipe after the jump. Enjoy! P.S. 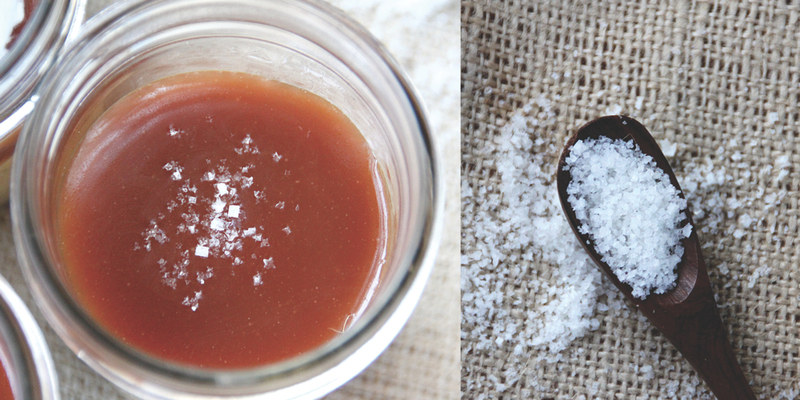 Check out this recipe for fluer de sel caramels, they’re amazing and make a delicious gift! Mix cookie crumbs, butter, and salt in a medium bowl. Press 1 tablespoons cookie mixture onto the bottom of each of eight 8-ounce mason jars or ramekins. Line a sieve with a double layer of cheesecloth and set over a large pitcher. Whisk egg yolks in a large bowl. Gradually whisk in hot milk, then cornstarch mixture. Slowly whisk in caramel. Return mixture to saucepan. Whisk constantly over medium heat until mixture thickens and a thermometer registers 175°, about 3 minutes. Remove from heat; whisk in butter, and salt. Pour through prepared sieve. Mix cream and vanilla in a small pitcher. Set aside. Spoon 2 tablespoons caramel sauce over each budino. Oh my gosh. I want this! Yes. Yes, you do :) it’s pretty incredible and soooooo easy to make! Try it! those need to get in my mouth.